The next two weeks will determine the MESC winner as the big fish start to make their way to the bays. The bigger fish are starting to be caught on a more regular basis and the leaderboard is changing daily. Jesse Cundari still leads the way and claimed the $1,000 weekly prize. Will Jesse’s fish hold on to win it all? I don’t think so but I hope for Jesse it does. Purple lures continue to produce well. The bays are now holding lots of fish in the early mornings and late evenings. Michael’s Bay and Providence Bay are seeing some nice fish caught. As always South Baymouth fishermen are leading the way with the bigger fish but with the longer derby this year i suspect the winners will come from Michael’s or Providence. The North Channel, especially Gore bay has been very quiet. The poor wind conditions have played a big part in the lack of North Channel production. Expect at least one of the top 3 fish to come from Gore Bay, they are out there, we just need the weather to cooperate. Everyone who weighed in fish today got a free pass into the ‘Can you out fish Dave?’ contest. A 14-15lb?? Michael’s Bay Chinook was carved up before I remembered to weigh it in, so congrats on the easy entry, it will not happen again. I have had a very solid roll on the bigger fish and I think I have my mojo back so good luck to all in the next 2 weeks. I have had a few screamers the last couple of days with a brute last night that I could not turn. I know it is hard to eat fish stories, they are usually tough to swallow but none the less I learn from each of them. 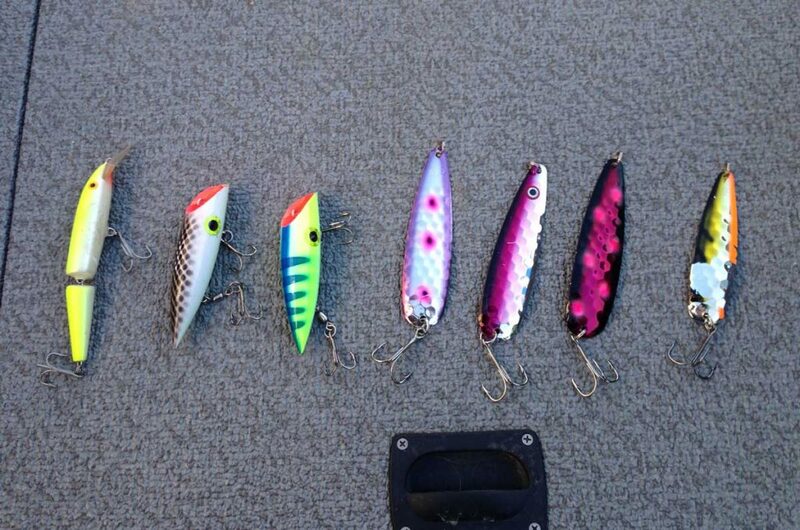 From left to right Rapala Silver Fluorescent Chartreuse, Two Lymans (unfortunately they are out of business), Warrior Purple Rain, Warrior Purple Alewife, Warrior Fireworks, and my favourite from last year The Chicken Wing. I have been talking to a few people that are still struggling to catch fish. It is my goal to see everyone catch something so I thought I would share some of my favourite lures from the past few years. All the above lures have taken fish but I fish them all in different ways. The Jointed Rapala is one of my all-time favourites in the bays. I use it in 20-30 feet of water and generally run it very far back (90-100′) behind the boat flatlining. The Lyman’s are also great flat-lining lures. The shallow bays, shoals and channels are where these little beauties excel. Same as the Rapala, 90-100′ behind the boat. The spoons I generally run on a downrigger although I will quite often flatline them in the shallows, 120′ or more behind the boat. On a downrigger, I will run a naked spoon 60-70′ back (i know that is a long ways but it is how I have had success), if I pair it with an agitator or flasher I will shorten up to 5-10′ for a flasher and 20′ for an agitator. I like to have a 3-4′ leader between the flasher/agitator and the spoon, if I use a fly (not pictured above) I shorten the leader to 18-24″. Using the right lure is never enough. I have a firm belief that your trolling pattern and speed will determine your catch rate. I troll 2.2-2.5 mph while flatlining plugs and spoons in the shallows, and I try to maintain 2.8 mph if downrigging. Don’t be afraid to change this up, lots of times a change of pace will prompt a salmon to strike. For me, the most important tip is NEVER TROLL IN A STRAIGHT LINE especially in the shallows flatlining. Trolling in an S pattern will change the speed of your lures and put them in water that your boat never passed through. Nothing that I do is gospel, there are plenty of salmon fishermen that are better than me, these are just my personal preference that I have adopted during my 35 years salmon fishing.